Summoned to yet another court appearance Thursday, detained student activists were determined to remain upbeat, marking Valentine’s Day outside the court. 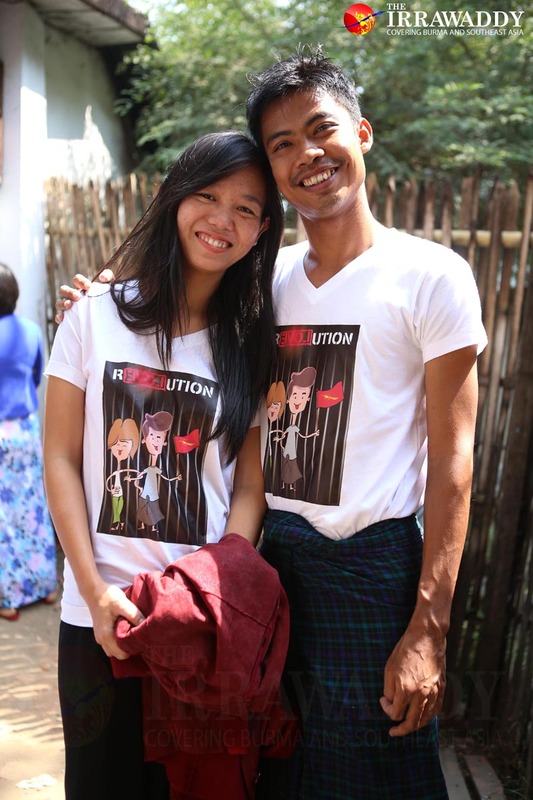 RANGOON — Summoned to yet another court appearance on Thursday, detained student activists were determined to remain upbeat, marking an early Valentine’s Day by wearing matching t-shirts and presenting each other with chocolates. Appearing at Rangoon Division’s Kamayut Township Court, Phyo Phyo Aung and her husband James, also known as Lin Htet Naing, posed for the cameras and exchanged gifts to mark the well-known day, which falls on Sunday. Another detained couple, Min Thwe Thit and Po Po, did the same. Fifty-three students remain detained for their role in demonstrating against the National Education Law early last year. Their protests came to a brutal end when police violently cracked down on the demonstrators at Letpadan, Pegu Division, on March 10. As their trials continue to drag on, courts from the commercial capital’s Kamayut, Botahtaung, Tamwe, Hlaing and Mayangone townships recently tacked on charges against at least one of the students— the 28-year-old Phyo Phyo Aung. A coalition of groups released a report last month in which they claimed some of the 53 detainees at Thayawady Prison faced illnesses that were potentially “life-threatening,” calling for their immediate release. Phyo Phyo Aung and James were arrested three months after their marriage in January 2015. They are being held in different prisons and only meet on hearing days. Min Thwe Thit was arrested in March and his fiancé Po Po has been on bail since April. On Thursday, Min Thwe Thit took to Facebook to express his feelings. “This year is worse as we have no freedom,” he wrote.